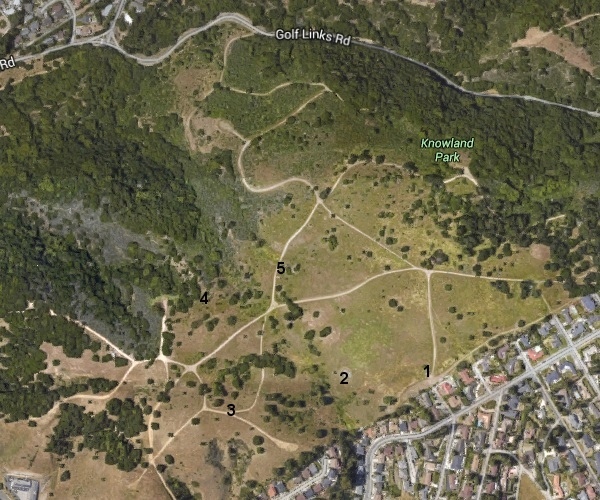 I enjoyed yesterday’s Wild Oakland outing in Knowland Park. It was hot, but a gradually freshening breeze made it a dry heat, and we spent a good bit of time in the shade for discussions. My goal was to explore the relationship between the ground of the actual Earth, in its strange and opaque reality, and the maps that geologists make of it. Here’s the set of places we visited, in Google Earth — we started at the end of Snowdown Avenue. There were obvious things, like big outcrops, and subtle things, like the texture of the dirt in the roads, that yielded information to us about the rocks underlying various places as we walked. 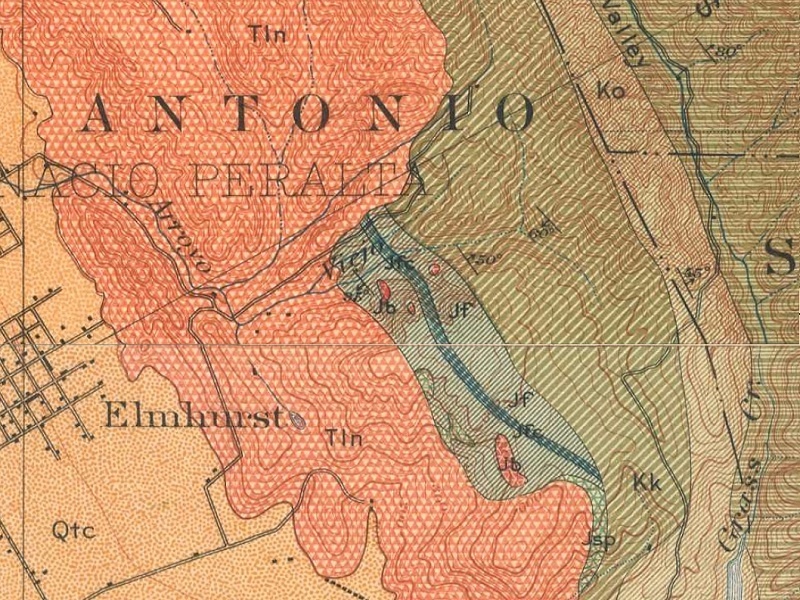 But that collection of observations wasn’t always easy to reconcile with the bold, definitive-looking patterns on the geologic map (800 pixels; see the same five localities on it). I tried to explain that a geologic map, especially one of Oakland, is as much an act of imagination as it is of observation. The rocks aren’t very well exposed, the different rock units are hard to describe and each one includes a lot of variety. The Leona “rhyolite” (Jsv) and the Knoxville Formation (KJk), to the extent we could see them, were easy to distinguish after a bit of exposure to them. But the major rock unit we encountered, the melange of the Franciscan Complex (KJfm), is really a meta-rock unit, a mixture of blocks (“knockers” in the local geo-parlance) of very different lithology. It’s a meta-rock unit in the same way you might call a package of frozen mixed vegetables a meta-vegetable. So that’s not an easy concept to grasp, but I think the group enjoyed getting a taste of the subject. 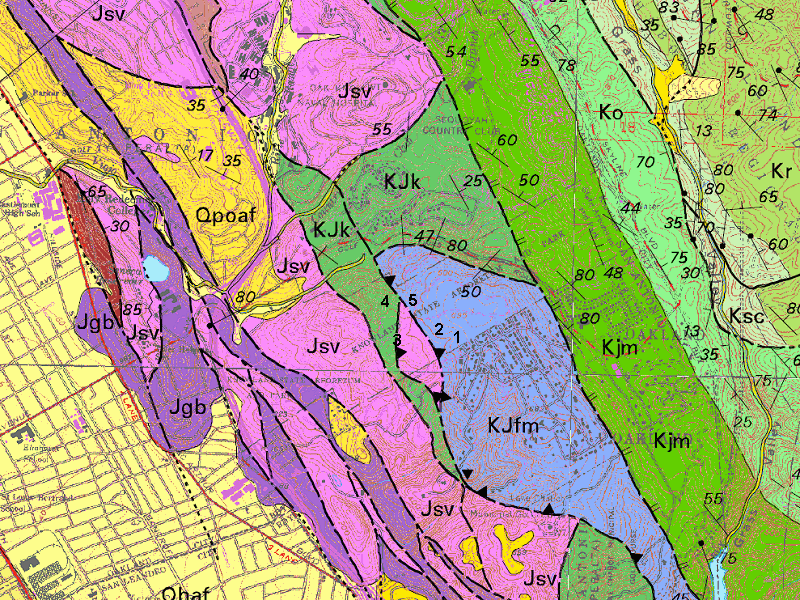 Notice that almost all of the contacts between different rock units on the map are shown as bold, dashed lines. These all mark faults — fractures where the rocks on either side have been displaced — and none of them are visible on the ground. They are inferred. We’re sure they’re there because our knowledge of rocks in general, and these rocks in the Bay area, leads us to that conclusion. It’s barely recognizable. We’ve learned a lot since then, but there’s no guarantee we know it all, and geologists of 2115 may have a sympathetic chuckle at our mixture of certainty and puzzlement today. Someone asked me what has changed in California geology since John McPhee wrote about it in Assembling California forty years ago, and I said the basics are still sound, but in some important topics our ideas have changed greatly. In the progress of geology there is no prospect of an end. This entry was posted on 21 September 2015 at 8:03 am and is filed under Franciscan rocks, Leona volcanics, Oakland geology walks. You can follow any responses to this entry through the RSS 2.0 feed. You can skip to the end and leave a response. Pinging is currently not allowed. It’s interesting to see how the view and knowledge of an area changes. Plus, I love the “meta-vegetable”, I might just steal that! I so wish I could have joined the walk. Oh well, your report of the event was splendid and I, too, particularly enjoyed adding “knockers” to my vocabulary.